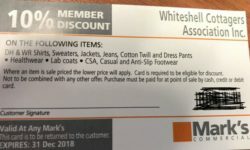 WCA MEMBERS – Get early access to Mark’s Storewide Sale on March 14, 2019. Only preferred clients of Mark’s Commercial get 25%. Thursday only. Always show your Company ID or Program Document when shopping at Mark’s.